Pinterest Traffic report - 12,406% Growth in 11 days! →Pinterest Traffic report – 12,406% Growth in 11 days! It’s 11 days today since I bought this Pinteresting Course and the exposure I’m getting is quite exciting. 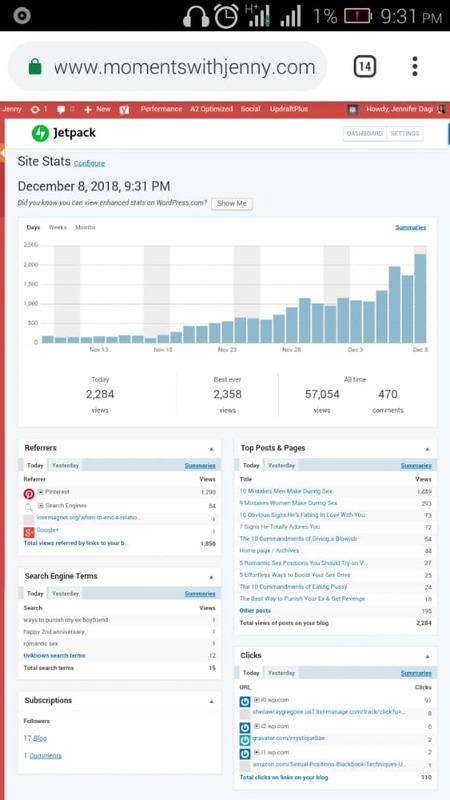 I feel excited to share what I have achieved this far (in terms of viewers and traffic) because I want you excited and join me to do something that gets results. Initially, Pinterest was considered the ladies’ platform. But men are getting in as it’s proven to be a serious business weapon. And Pinterest is free so nothing stops you from hopping in. Grab your free account here and if you are already a member, follow me here. While Pinterest is a social media property like Facebook, Twitter, Instagram, etc, it’s as well a search engine. See how it’s different from Google here. That’s 643 not 643k. And 17 engagement was just enough to send me packing. But my friend from BlogToolsCorner kept telling me it was a traffic gold mine. I finally got connected with Jennifer Dagi who shared her results with me after buying this course. She had been on Pinterest with no good results. But this course has raised her to over 1300 blog page views from Pinterest alone. It was 8:19 am when she printed this screen. Pinterest had already sent her 599 clicks. And you see the rise in traffic from one point. From 643 viewers and 17 monthly engagements to 12k viewers and 298 monthly engaged in about 2 weeks. What about Clicks to my blog? Getting large figures on the Pinteret platform isn’t as exciting as transforming them into clicks to your blog. Note however that these ain’t all on my pins alone. They include views on others’ pins I saved as well. So the clicks are shared between my blog and the blogs of others whose pins I saved. 72 users from Pinterest and what’s exciting is the average Session Duration which is almost 6 minutes. That shows Pinterest readers find more value on my blog. Again, I get 2.17 (average) number of pages viewed per session which is awesome. This explains the 76.79% bounce rate. I need to increase the viewers and engagement on Pinterest. But most importantly, I need to convert these viewers to visitors to my blog. Get more followers and group board contributions. Learn more about how Pinterest functions. Be consistent and give time a chance. Pinterest is a huge traffic tool. It’s working for me and the traffic is more engaging. My encouragement is to you is to give it a try. You may want to also purchase this course to get started. Enstine this is awesome man. Shows the power of a full commitment to any network. If you really work Pinterest with an all out effort you will see a big time increase in weeks. Nice job my friend! I need to get that all set up. Seems like the next best option to Twitter for content marketing and getting my articles out there. You need to jump on this platform man. It’s getting more and more result-driven. The traffic people get from it is far ahead of what they get from Twitter and Facebook. I have always loved Pinterest – its great for traffic but after reading this post I can see that I am not doing it right. Those stats are awesome Enstine! Definitely Pinterest is a gold mine that has not been exploded yet. Thanks for sharing your experience so far. Thank you, Do you recommend any other social media as well beside Pinterest, I want to work on two platforms for more traffic.